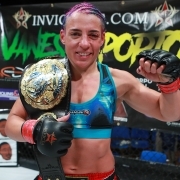 A grizzled veteran hailing from Sao Paulo, Brazil, Vanessa Porto is veteran of twenty MMA fights. With a record of 15-5, the submission specialist has faced a who’s who of Women’s MMA, including Cris Cyborg, Amanda Nunes, Jennifer Maia, and Tara LaRosa. Currently competing in Invicta’s 125lb division, and few fighters can match her experience or tenacity. Before facing off against Barb Honchak for the inaugural Invicta Flyweight title April 5th, Vanessa Porto sat down to answer a few questions for us. Corey Smith: You started training in 2004 in Brazil. Did you have any martial arts background at that point? What were those first few weeks like? Vanessa Porto: No I walked into the dojo for the first time with no experience but as soon as I started training I fell in love with it and I have never looked back. The first few weeks of training were life changing. I felt like I had so much to learn and there weren’t enough hours in the day to quench my thirst. CS: You have said that you were hooked on MMA after your first fight against Carina Damm. What drew you to MMA and what was it about MMA that made you “hooked” as you said? VP: The competition and the adrenaline of going into a cage with another human being that is trying to hurt you. MMA has so many disciplines you never stop learning. It is like an endless book. It changes your life in many different and positive ways. CS: For most of your career you fought in your native Brazil. What are the major differences between a Brazilian MMA match and an American match? VP: In Brazil the shows are smaller and less organized. Invicta is a whole other level so it’s not fair to judge them against the shows in Brazil. Invicta beats any other show in Brazil or America. In Brazil you fight more for pride than to build your career, so a lot of fighters including myself have taken fights that you wouldn’t see put together in America. I took the Cyborg fight being outweighed by 18lbs. No athletic commission in America would allow that fight. Only in Brazil! CS: Many of your opponents at the beginning of your career have gone on to become major names in the world of Women’s MMA, none more so than Cris “Cyborg” Santos. You took that fight on one day’s notice. How much did you know about her going into that fight? What did you learn from that fight? VP: I knew that she was out of Chute Boxe, who at the time were the number one team in Brazil. All killers. I still accepted the fight because I was very anxious to compete again. I learned a lot about myself from that fight. I wasn’t intimidated by her like a lot of other fighters have been. I came out to finish her and I almost did. I never gave up throughout the fight and kept fighting to the last bell. I learned that I can be pushed to the brink and keep fighting. It gave me a lot of confidence throughout my career knowing that I did well against Cyborg, especially after she became the baddest women on the planet. CS: Back to the quality of your opponents early in your career, do you think that it helped your career to face such talented women so early? VP: It’s hard to say, I come from a different era where we just fought whoever was put in front of us. But it is good to build your career up at a slower pace like they do now. Being thrown into the fire early made me better at a faster pace because of the level of fighters I fought early on. I had to get better quick, so I trained nonstop and dedicated my life to this. CS: When you weren’t able to secure an MMA fight, you fought in BJJ tournaments and took boxing matches. How much did that aid in your development rather than simply continuing to train in the gym? VP: It helps a lot. It might not be MMA, but it is live competition and its still striking and grappling. I always wanted to stay active so when the MMA fights dried up, then I had to do other things to stay sharp. You are still looking across from someone that wants to hurt you! CS: You are a member of The MMA University in New Jersey. Are you training there full time, or are you still mainly training down in Brazil? VP: I’m still living and training in Brazil, but I fly in early before the fight to train at The MMA University. My husband Perdo Iglezia is my head coach, and he trains me in Brazil and New Jersey. My manager Chris Vender owns The MMA University so that is why we end up in New Jesrsey. They have very good coaches with a lot of MMA experience. They are a very good team to train with. VP: I like mountain biking and spending a lot of time outside in nature. But training is a large chunk of my life. I like to wind down after a long day of training by reading a book or getting on the Internet. CS: The MMA University also manages your career full time, a situation that you have not always had in the past. What does their management do for your career? CS: Most fighters say that the weight cut is the hardest part about being a fighter. Aside from that, what would you say is the hardest aspect of being a fighter? VP: Just the training camp where your whole life gets put into one big schedule. From eating to sleeping to training, everything you do is put into a schedule! 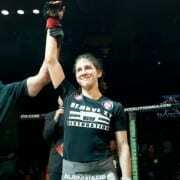 CS: A common theme among the athletes of Invicta FC has been gratitude for being able to fight on a regular schedule. What does fighting for Invicta FC mean for you? VP: It has been amazing to have a home where you know you are going to fight on a regular basis, and earn a paycheck on a regular basis. I feel blessed to be with the Invicta from their beginning and I know when I look back 10 years from now this will be a very special time in my career and for WMMA. CS: Your first bout under the Invicta banner, at Invicta 2 you fought at 135lbs, and then at Invicta 3, your bout was scheduled for 125 pounds. After weigh-ins, it was changed to a catch-weight bout at 127. What did you learn from that first weight cut, and why do you feel you will be more successful at 125? 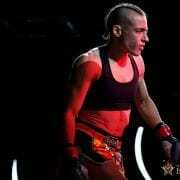 VP: At Invicta 2 there were 13 other 135lbers fighting on the card and I was the smallest one there. My manager decided to move me to 125lbs after seeing this and knowing that I didn’t have to cut weight to get to 135lbs. I fought at 131lbs in Brazil, so it was only 6 more lbs. With his precise weight cutting process it was a perfect weight cut when I dropped to 125lbs at Invicta 3. I felt a lot stronger and faster at 125lbs. My opponent Tara LaRosa was unable to make 125lbs and was stuck at 127lbs, but I took the fight anyway. I was going to fight her no matter how much she weighed. I had something to prove. CS: You are scheduled to fight Barb Honchak for the inaugural Invicta FC Flyweight title. What type of challenge do you think Honchak presents? Have you been able to see much video of her past fights? VP: Barb is an awesome fighter and that is why she is fighting for the belt. She is a very complete fighter and a very dangerous opponent. I have watched video, but she continues to improve so she will be the best Barb Honchak yet. CS: What would winning the Invicta Flyweight title mean to you and your career? VP: I have won titles before, but never a World title. Everything I worked and sacrificed for all these years will finally pay off. It will be a great accomplishment and something that I have dreamed about for a long time. I have paid a lot of dues fighting since 2004 and I want to create my place in WMMA history. CS: Finally, MMA is equally a team sport as it is an individual sport. Who would you like to thank? VP: My husband Pedro, My manager Chris, Shannon Knapp and Janet Martin, Combatives Gear, Tussle, Dr Taverni, Dr Haley and all my sponsors and fans. April 5th is the best card in Women’s MMA history and I hope to be victorious and prove I’m the best 125lber in the world.